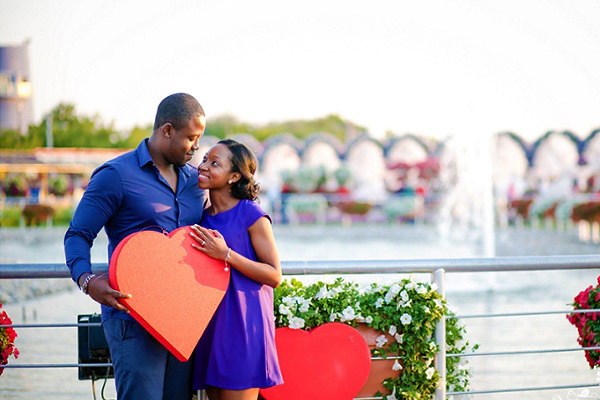 You should definitely take your time celebrating your engagement but when you’re ready to officially start planning, here’s how to dive in. Before you try on your wedding gown, pick your #asoebi, book a band or sample a bite of cake, look at the big picture and imagine what kind of style and vibe you want to set for your wedding and where you would want to hold it. Close your eyes and picture your fantasy wedding. What do you see? Is it an #Owanbe ceremony in a big hall with over 500 guests? Are you walking barefoot on a beach? Or maybe it’s in a 5 star hotel in Dubai. While you’re picturing your perfect wedding, here are some key questions to consider: Big (everyone you know) or small (just close friends and family)? Outdoors or indoor? Is it taking place in my hometown or my current city or a destination wedding? Modern, classic, romantic, vintage or all-out glam? Fancy, casual or somewhere in between? To help you get a better idea of what you want and what you don’t want, spend some time gathering inspiration. Sit down with your families and figure out how much everyone is contributing. This number will affect every decision and purchase you make, so be sure to work out your budget before you start planning with your wedding planner. It can be an uncomfortable conversation to have, but it’s better to get it out of the way now so you have a realistic picture about what you can spend. As you begin to build your guest list, you’ll need to consider a number of factors. If you have a particular ceremony or reception site in mind, for instance, you’re going to be limited by how many people it can accommodate (you can’t squeeze 500 people into a small hall). Would you rather have quality one-on-one time with each guest or throw a once in a lifetime party for all your friends and family? If mom and dad are inviting throngs of friends and family, you’ll have to hear them out, especially if they’re footing a major part of the bill. Keep in mind that more guests means higher prices, as catering costs are generally calculated on a per-head basis. So, in addition to venue, your budget will have a big influence on the size of your guest list. Worried that you’ll look gift-grabby if you have a wedding gift registry? Don’t! With your friends and well-wishing relatives, everyone will appreciate your foresight although gifts are optional, some will want to give you something to commemorate the occasion, so have it beforehand so they don’t have to ask (or guess) what you’d like. One thing to note: Don’t include your wedding gift registry information in your wedding invitations instead it’s advisable your just put a links on your online wedding catalogue/website. Now it’s your turn to propose to your bridesmaids and groomsmen. Remember, the earlier you ask, the sooner you can enlist their help. Keep in mind that being a part of your wedding is them agreeing to spend their money and donate their time. Be considerate and kind by informing everyone about all your plans (including costs for attire, bachelor party, bridal shower and more), showing them a good time and making sure they know how much you appreciate them. If you’re a super busy couple, have demanding jobs or have big dreams for your wedding weekend, then you should hire a full-time wedding planner to help you prepare your entire event, from the wedding planning to the honeymoon. You can also hire a part-time wedding planner to assist with the wedding blueprint which includes budget, schedule, list of good vendors and preferable vendors. Your reception venue will become the backdrop for virtually all your photos and can influence everything from your budget and guest list to smaller details like your menu. Ensure that you get the look, price and extras you want by scouring local listings, shopping around, scheduling visits and booking early. Bonus: By signing your venue contract, you will officially have your wedding date. If you just can’t imagine getting married without a certain local band playing at the reception or a photographer whose work you love, act fast. Many top wedding photographers and other in-demand vendors are hired more than a year in advance and once they’re booked, they’re gone. Begin your search by browsing dress photos online and saving your favorites, you’ll want to take them with you to your appointments. Then, learn the basics before setting foot in a dress salon. Read up on silhouettes, necklines, trains and hues that might flatter you. Palmfront wedding catalogue can help you share your unique love story with all your friends and family. Create your online wedding catalogue to get started.